On February 25, 55-year-old John Miri and 38-year-old Wisam Daman pleaded guilty to charges of failing to maintain an effective anti-money laundering program, according to a press release issued by U.S. Attorney Barbara L. McQuade. Miri operated and managed Junction Party Store, and Daman operated and managed Big Apple Fruit Market, both located in Southwest Detroit. Jarod Koopman, IRS Criminal Investigation Acting Special Agent in Charge, joined McQuade in the announcement. Both stores were registered as MSB’s, or Money Services Businesses with the state. Essentially, Junction Party Store and Big Apple Fruit Market would cash checks in amounts of more than $1,000 for their customers, for a fee. Under the Bank Secrecy Act, businesses who provide this service for their customers are qualified as financial institutions. Because the two stores are considered financial institutions, they are required to file CTR’s or Currency Transaction Reports with the Financial Crimes Enforcement Network. When a customer cashes a check for an amount greater than $10,000, a CTR must be filed. In their positions as managers/operators of the stores which were considered financial institutions, Miri and Daman were obligated to develop, enforce, and maintain effective anti-money laundering programs. Between late 2011 and early 2012, the two store owners cashed a total of nearly $15 million in refund checks issued by the IRS for Juan Carlos Pena-Lora, checks which were issued to alleged taxpayers in New Jersey, New York, and other eastern states. In all, there were approximately 2,000 checks cashed by both stores combined. 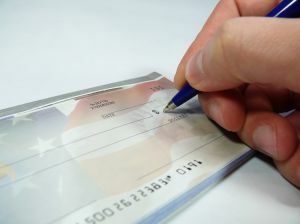 Daman and Miri charged a fee for cashing the checks, a fee which is based on a percentage of the total amount of each check. The IRS refund checks were issued after false income tax returns had been filed using names/social security numbers that had been stolen from Puerto Rican nationals. On the dates Daman and Miri cashed checks for Pena-Lora, those payments were greater than $10,000, however the two business owners did not file CTR’s for some of the cash payments as required. Because of this, the two men were charged with failure to maintain an effective anti-money laundering program, an offense punishable by fines of $250,000 and/or up to five years in prison. Daman and Miri have not yet been sentenced. Convictions for white collar crimes can result in serious consequences. As you can see, even when an individual pleads guilty, the penalties are still extremely harsh. Not only may these men face substantial fines and prison time, their reputations and businesses are likely ruined. If you have been arrested or are under investigation for any white collar crime including money laundering or embezzlement, consult with a Michigan criminal defense attorney at once.